William J. Murray, Chairman Religious Freedom Coalition: My heart burns to ashes because of my love for jihad." Those are the words of the medical doctor who blew himself up and killed seven CIA employees and injured even more in Afghanistan this month. Dr. Abu Dajana Al-Khorasani was a Jordanian whom the CIA believed they had recruited to work for them. Did they not read his wife's books on Jihad? Did they not know that his wife had translated an anti-Western book written by Saddam Hussein? Why was this man not even searched as he entered a US military base? The answer of course is the poison of political correctness, from the White House through the CIA all the way to the graveyard. Had Al-Khorasani been an Iraqi Christian refugee, he would have been strip searched. The dead doctor is now a Jihadist hero whose posthumous article on his love of Jihad and hatred for America is appearing throughout the "Islamic world." Read the killer doctor's article. Tags: CIA, Islamic terrorist, Jihadist, murderer, political correctness, William J. Murray To share or post to your site, click on "Post Link". Please mention / link to the ARRA News Service. Thanks! by Phyllis Schlafly Report: If Barack Obama had campaigned on what he has actually done in his first 300 days in office, would he have been elected? That's the question so many are asking. If Obama had told us that his Stimulus package is a sham because it does not create private-sector jobs (as a tax cut would do), so that the unemployment rate would rise to over 10%, with 15 million Americans unemployed plus another 11 million underemployed, could he have been elected? If Obama had told us that his promise to create "shovel-ready" jobs (in construction and infrastructure, where men have lost the majority of jobs) was a big lie because the Stimulus jobs he did create were inside jobs in education and government (mostly for women, who had not lost many jobs), would he have been elected? If Obama had told us that he planned to fire all Republican and conservative civil service employees and replace them with friends of Obama, would he have been elected? If we had known that Obama would be totally incompetent as commander-in-chief of his chosen war in Afghanistan, and would not speak to the general in the field for 70 days, ignoring his dire report for six weeks, would Obama have been elected? If Obama had campaigned on increasing federal spending and debt from a multi-billion-dollar level to multi-trillions, would he have been elected? And what if Obama had told us that his promise to "spread the wealth around" would balloon his first year's budget deficit to $1.6 trillion? If Obama had told us that his promise to "spread the wealth around" meant wiping out the Republican welfare reform of 1996 and increasing annual welfare spending by 39% to almost $1 trillion a year by the end of his first term, would he have been elected? If Obama had told us he would have the government guarantee 90% of all U.S. mortgages, imposing $5 trillion in off-budget debt on U.S. taxpayers who had faithfully made their own mortgage payments, would he have been elected? And what if Obama had told us he would make the taxpayers responsible for over 80% of all student loans at a cost of $1 trillion over the next decade? If Obama had told us he would take over the automobile industry faster than any socialist dictator ever nationalized an industry, fire the CEO of General Motors and replace him with a Democratic Party campaign contributor, would Obama have been elected? If Obama had campaigned on closing down thousands of profitable car dealers, nearly all Republicans, would we have believed that this vindictive financial retaliation against those who didn't vote for Obama could happen in America? If Hugo Chavez, the Communist who nationalized most of Venezuela's industries, had said before the election (some claim he was joking) that "Comrade Obama" would nationalize General Motors — "Fidel, careful or we are going to end up to his right" — would anybody have believed it? If talk shows had warned against such a socialist takeover, would the Obama-loving media have accused them of McCarthyism? If Obama had told us that he would make the U.S. government a major shareholder in Citigroup (one of the world's largest banks), would you have believed he could get away with this socialist takeover? If Obama had told us he would spend $3 billion in a Cash for Clunkers program that would use taxpayers' funds to buy mostly foreign cars, would he have been elected? If he had said he would grind up thousands of preowned American autos, thereby destroying the possibility of car ownership for those who can't afford a new car, would we have believed him? If Obama had told us he would appoint 34 Czars, reporting only to himself and not vetted or confirmed in the constitutional way, building a powerful unitary executive branch of government, would he have been elected? What if he had told us that his Green Jobs Czar had been a Communist, that the Science Czar wrote in a college textbook that compulsory "green abortions" are an acceptable way to control population growth, and that his Regulations Czar would argue that animals are entitled to have lawyers to sue humans in court, would Obama have been elected? If Obama had admitted that his health care plan would include the same provisions for which he ran negative TV ads against Hillary Clinton (a federal mandate requiring every American to buy health insurance) and against John McCain (a tax on high-cost employer-based plans), would Obama have been elected? And what if Obama had told us that his federal health plan would pay for abortions without regard to the Hyde Amendment, and provide full health care (including private doctor visits) for immigrants without requiring proof of legal residence? If Obama had told us that he would push for "legal status" (a.k.a. amnesty) for 12 million illegal aliens (as announced by Homeland Security Secretary Janet Napolitano on November 13), would he have been elected? What if Obama had revealed that his Secretary of the Treasury (who hadn't paid all the taxes he owed) would go to a March 25 meeting of the Council on Foreign Relations and say, "We're actually quite open to that suggestion" of moving away from the dollar as the world's reserve currency, would Obama have been elected? If Obama had declared during his campaign that his first major speech abroad would be to the Muslim world, and that he would proclaim in Muslim Turkey that "one of the great strengths of the United States is . . . we do not consider ourselves a Christian nation," would he have been elected? What if Obama had declared that, soon after his election, he would illustrate his claim to be a "citizen of the world" by apologizing for America all over the world, and then bowing obsequiously to the King of Saudi Arabia and then to the Emperor of Japan, would Obama have been elected? Tags: Eagle Forum, Obama administration, Phyllis Schlafly, Barack Obama, citizen of the world To share or post to your site, click on "Post Link". Please mention / link to the ARRA News Service. Thanks! Welcome to the "Brave New World" Progressive Young People. While not all young people are enamored by President Obama and Obamacare, it was a majority of young voters that voted for "hope and change." Hope For Change Drives Youth Vote, Feb. 5, 2008: Between classes and on the way to work, Super Tuesday brought young people out to vote in huge numbers. And among them, supporters of Barack Obama were easiest to find. Voters 18 to 33 were drawn to Obama because they thought he could unite a divided America and for that matter, the world. Young adults are in for a wake-up call if health care reform passes. For the first time ever, the federal government is going to require that everybody obtain health insurance coverage. . . . [F]or young adults, many of whom are not currently covered, the health care bill will add a new and costly expense to their budgets. "The Census Bureau tells us there are 18 million people between the ages of 18 and 35 who are uninsured -- roughly half of the uninsured population are younger people in that age group," said Anne Kim, with the non-profit think tank Third Way. The individual mandate has teeth to it, and anyone who refuses to get coverage will be fined under the health care package. In the Senate bill, the fines start low at $95 a year in 2014, and they eventually rise to between $750 and $2,250, depending on the income of the person being fined. In the House bill, the fine is calculated as 2.5 percent of the income of the person being penalized. . . .
"Some of the costs of an individual coverage or a family policy could be as high as $10,000 or $14,000 in a few years' time," he said. "And so there's thousands of dollars of premiums at stake and the fine is maybe only $750." Ron Russell at TOTUS responds: One thing I have learned over the years is that young people do NOT like being told what to do. And those in 18 to 35 group are going to be told they have to buy insurance coverage or else.... I doubt they will appreciate the president taking money from their pockets to pay for something they feel they don't need at this point in their life. Welcome to the real world of progressivism young folks, this is just the beginning of things you will not like. And something else guys this huge debt that Obama and gang are running up; I won't have to pay it off, no not me, it belongs to you and your kids. Yes, you voted for Obama and now you have to live in Obama's world. I would say it fitting. 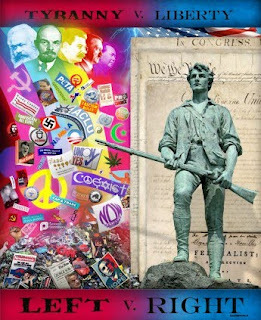 So buckle up and get ready for the rough ride into your future into that Utopian dream of Obama's Brave New World. Tags: compulsory health insurance, government healthcare, mandatory insurance, Obamacare, young voters To share or post to your site, click on "Post Link". Please mention / link to the ARRA News Service. Thanks! • A review of its financial statements finds that in 2008, AARP received $652.7 million in direct “royalties and fees” from selling products like Medigap supplemental insurance policies. Royalty revenues now comprise more than half — 60.3% — of all AARP revenues; in 2008, fully 38% of AARP’s $1.1 billion in revenue came directly from United Healthcare. How does relying on health insurance company royalty fees for more of its total revenue than membership dues, grant revenue, and private contributions combined make AARP an “independent” seniors advocacy organization? • In November, news sources reported that AARP suspended the sale of “limited-benefit” health insurance policies, largely as a result of pressure from Members of Congress concerned that the organization was selling policies advertised as a “smart option for the health care insurance you need,” even though the policies would only pay up to $10,000 for surgery costs. However, the fate of the more than 1 million policy-holders who purchased limited-benefit coverage from AARP is unclear. How does AARP selling “bare bones” health coverage as an “option for the health care insurance you need” in order to pocket additional royalty fees help seniors? • A Bloomberg news analysis published in December found examples of seniors charged hundreds of dollars above market rates for AARP-branded coverage—a practice which several of the organization’s own members called “unconscionable.” How does overcharging insurance applicants who buy AARP-branded coverage—so that AARP can receive royalty fees its members viewed as “kickbacks”—help seniors? • As part of its support for Democrats’ health “reform,” AARP has supported cuts to Medicare Advantage plans that could cause millions of seniors to lose their current coverage. As a result, many more seniors may be forced to purchase supplemental Medigap policies should their existing Medicare Advantage plans be taken away from them. However, H.R. 3200 would place strict price controls on Medicare Advantage plans—requiring them to pay out 85% of premium revenues in medical claims — Medigap policies face a far less strict 65% requirement. How does forcing millions of seniors to lose their Medicare Advantage coverage — so that AARP can sell more Medigap policies, and generate additional “kickbacks” from same—help seniors? • A review of AARP’s most recent Form 990 filing with the Internal Revenue Service finds that in 2008, then-CEO Bill Novelli received cash compensation of $788,957 and “other compensation” of $216,423, for total compensation of $1,005,830. AARP’s 18 highest officials (as well as company trustees) received total salaries of $6,623,777, along with nearly another million dollars ($924,556) in other compensation—an average of more than $51,000 in perquisites and additional compensation per employee. How does spending more than $7 million to fund 18 high-paid staff positions — and paying a CEO more than 78 times the average annual Social Security benefit of $12,738 ($1,061.50 per month) — serve seniors? Moreover, how many AARP members are aware that they pay dues to an organization whose CEO receives more than a million dollars in salary and perks? • The Form 990 filing also reveals donations from AARP to various groups whose purposes do not appear directly to coincide with senior advocacy, including money for “affordable green housing,” donations to the host committees for the Republican and Democratic National Conventions, more than $1 million to 56 school districts, and over $2 million to a local PBS affiliate. How do millions of dollars in donations to elementary and high schools, as well as a public broadcasting station, help seniors? Given these facts, many may question: Whom does AARP serve: Its members, or the political—and pecuniary—interests of its senior executives? And is AARP a seniors’ advocacy group, or a billion-dollar insurance company masquerading as a “charity” organization? AARP Dirty Secrets - Part 3: Will the Real AARP Please Stand Up? Tags: AARP, dirty secret, government healthcare, kickbacks, medicare, Medigap, royalties, seniors To share or post to your site, click on "Post Link". Please mention / link to the ARRA News Service. Thanks! 1. . . . Unemployment drives presidential approval numbers, and presidential approval numbers drive midterm election results. 2. President Barack Obama’s approval numbers are hovering just a tick below 50%. Since 1962, the average House midterm loss for the president’s party when his approval is sub-50 percent is 41 seats. The GOP needs 40 to take the House. 3. . . . The 85,000 job loss was worse than expected and will be played that way the media. The continuation of double-digit unemployment also resonates with voters. And not a in a good way. 4. Then will come the second-take stories that will notice the shrinking labor force, which dropped by nearly 700,000 from November. Had it stayed stable from last month, the jobless rate would have been 10.45. Had it stayed stable since August, the jobless rate would be 11%! 5. But wait, there’s more! The U-6 rate rate which combines the basic jobless rate, discouraged workers, part-timers-who-would-rather-be-full-tim ers climbed to 17.3 percent. And the average duration of unemployment rose to a record high 29.1 weeks. 6. . . . as the slowly growing economy eventually draws workers back into the labor force, the jobless rate will creep up to new highs. (Big companies remain cautious about hiring, and small biz remains under pressure due to tight capital markets.) The validity of the Obama recovery plan will seriously be cast in doubt. 7. The sickly labor market will also make it that much harder for the White House and Hill Dems to celebrate what is likely to be a brisk upcoming GDP report in the 4-5% range. That seems like an abstract number compared to the unemployment rate. 8. Combine a weak labor market – which may appear to be getting worse to voters – with the moribund housing market and rising gas prices, and you have a toxic triple threat that will be poisonous to Democratic incumbents and further drain Obama’s political capital. 9. Also, watch how these numbers play with Senate and House Dems thinking about resigning like Chris Dodd and Byron Dorgan. A big improvement in the jobs numbers might have reassured any worriers that 2010 might not be as tough as some currently think. Now it looks a bit more like the worst fears of Democrats might be realized: losing the House and a half-dozen or more Senate seats. Tags: American jobs, jobs, Democrats, unemployment, US Congress, December, 2009 To share or post to your site, click on "Post Link". Please mention / link to the ARRA News Service. Thanks! 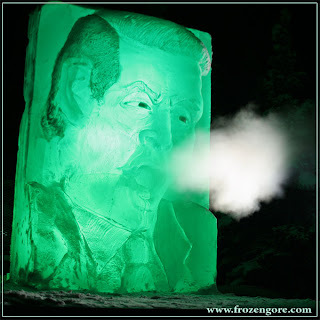 Do you believe Al Gore or your own eyes? Peru’s mountain people ‘face extinction because of increasingly cold conditions’...Gary Bauer: "In spite of reality, many liberal Democrats are pushing a Big Government cap and trade scheme with massive new energy taxes as the sole solution to global warming. With your help, we’ll fire as many of them as we can 298 days from now!" Tags: Al Gore, Drudge Report, global cooling, global warming To share or post to your site, click on "Post Link". Please mention / link to the ARRA News Service. Thanks! • Several senior AARP executives receive salaries from other affiliates of the organization, including the AARP Foundation and the AARP Institute. For instance, AARP’s then-CEO William Novelli—who received at least $1 million in total compensation in 2008—is also included on the AARP Institute’s list of officers and highly compensated employees. • The overlapping and potentially confusing relationships between senior executives at AARP, its Foundation, and its Institute raise questions on their own—namely, whether individuals are serving multiple masters by dividing their work and energies among various positions within the AARP conglomerate. • Four individuals serve as officers and/or directors for AARP, its Foundation, and its Institute—and another three individuals serve as directors and/or officers of two of these three organizations. Most concerning, the entire AARP Institute’s board is comprised of these seven individuals employed elsewhere within the AARP Empire. • Some may also be troubled by the apparent lack of full disclosure regarding these senior individuals’ compensation. For example, while Robin Talbert’s name appears on the AARP Foundation’s Form 990 filing, the form shows compensation from another AARP - related organization that is neither AARP nor the Institute. • The Form 990 also reveals a transfer of funds from AARP to its Foundation of more than $21.6 under the stated purpose of “general support.” The AARP Foundation also received more than $10.1 million in “in-kind contributions” and $26.5 million in loan guarantees from AARP; the IRS filings do not disclose whether or what amounts the AARP Foundation paid in exchange for such loan guarantees. Many may question why more than $58 million—equal to nearly one quarter of all member dues received by AARP in 2008—is being diverted to another organization, and what purposes such a diversion is intended to achieve. Tags: AARP, dirty secret, government healthcare, kickbacks, medicare, royalties, seniors To share or post to your site, click on "Post Link". Please mention / link to the ARRA News Service. Thanks! “Jihadism’s list of grievances against the West is not only self-replenishing but endlessly creative. Osama bin Laden’s 1998 fatwa commanding universal jihad against America cited as its two top grievances our stationing of troops in Saudi Arabia and Iraqi suffering under anti-Saddam sanctions. Today, there are virtually no U.S. troops in Saudi Arabia. And the sanctions regime against Iraq was abolished years ago. Let me see if I understand the president correctly: Because Al Qaeda was using our terrorist detention facility as a recruiting tool, we must shut it down. When did the United States of America start taking orders from Al Qaeda? And is it plausible that some young Yemeni man heard about Guantanamo Bay for the first time and said, “That’s it! I’m going to blow myself up to punish the infidel Americans for locking up Muslims in Cuba”? I don’t think so. If Guantanamo Bay is such a major cause of terrorism, why does the president think Al Qaeda attacked us on 9/11? There was no GITMO on the day the World Trade Center towers fell. There was no GITMO on the day the towers were first attacked in 1993. There was no GITMO when the USS Cole was bombed in 2000. There was no GITMO when our embassies in Kenya and Tanzania were blown up. I hate to break it to you, Mr. President, but even if you pad-locked and fumigated GIMTO tomorrow, al Qaeda in the Arabian Peninsula would not abandon its jihad against the West. And shutting GITMO in response to anything Al Qaeda says will only be interpreted by our enemies as weakness on our part and a victory for them. No, Mr. President, the prison is not the problem. Radical Islam is the problem. Stop bowing to our enemies! Tags: al Qaeda, Barack Obama, Gary Bauer, Gitmo, Islamic terrorism To share or post to your site, click on "Post Link". Please mention / link to the ARRA News Service. Thanks! Rasmussen Reports reveals that Arkansas Blanche Lincoln's popularity has not improved. In fact, "Lincoln are pretty much the same as last year’s while she prepares to face Arkansas voters in November." A new Rasmussen Reports survey shows that "Lincoln’s support for reelection at 38% or 39% no matter which of four potential Republican challengers she is matched against. . . . The two-term senator, who was reelected with 54% of the vote in 2004, appears more vulnerable because of her visible and pivotal role in the Senate debate over health care. Lincoln was the last Democrat to vote for allowing the debate to formally begin . . ."
Daily Kos, a liberal democrat progressive Obama site, responds, "The closer those incumbents were to 50 percent, the more likely they were to survive. Lincoln, stuck at around 40 percent, is in dire straits. No incumbent dipping into the 30s survived in '06 or '08. Quite simply, she is unelectable. Democrats have a thick bench in Arkansas, and could make a serious bid to hold the seat. But Lincoln won't pull it off. She's toast. If Lincoln cares about her state and her party, she'll do the honorable thing like Chris Dodd and retire. Otherwise, let's hope Lt. Gov. 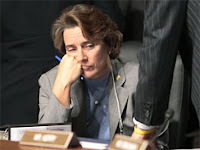 Bill Halter forcefully retires her in a primary." It looks like Democrats and Republicans can agree that it is time to Dump Blanch Lincoln. Tags: Arkansas, Blanche Lincoln, DailyKos, Rasmussen Reports, Senate To share or post to your site, click on "Post Link". Please mention / link to the ARRA News Service. Thanks! ARRA Editor: The people's voice has been ignored and now the press is suffering the same fate. The following Examiner editorial is a welcome breath for freedom. Indeed, "It's time for a sit-down protest by journalists whose first job is to uphold the public's right to know what its government is doing." Examiner Editorial, Washington Examiner: For decades, among the first thing cub reporters learned when covering local government was that the words "executive session" meant public officials were going behind closed doors to conduct business they wanted to keep out of the public eye. More often than not, the journalists barred from the meeting passed influential developers and other special interest lobbyists on their way in to confer with the decision makers. Thanks to public meetings laws requiring city councils, county boards of supervisors, and other local and state officials to meet and vote in public, it's much tougher for them to hold such clandestine gatherings. Judging by the silence of the hundreds of professional journalists covering Congress for the mainstream media, however, it appears this lesson from Covering Government 101 has been forgotten. 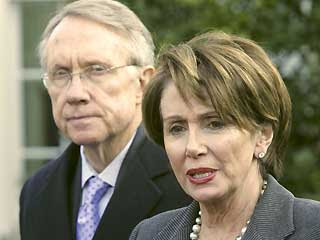 President Obama, Senate Majority Leader Harry Reid and House Speaker Nancy Pelosi -- all of whom have in recent years promised unprecedented levels of transparency in government -- are flouting their own words by meeting in secret to write the final version of Obamacare. They are doing this to avoid the public meetings of a bipartisan conference committee representing the Senate and House and the multiple, on-the-record roll call votes required in both chambers on a conference committee report. The most radical expansion of central government power in American history is happening right under these journalists' noses, and yet they raise not a peep of protest when the doors close, effectively barring them from doing their jobs at a critical juncture. Where are the Society of Professional Journalists, the American Society of Newspaper Editors, and the Radio and Television News Directors Association? These august organizations vigorously and rightfully protested former Vice President Richard Cheney's secret meetings with oil company executives in the early days of the Bush administration. They also wailed loud and long about the Bush administration's abuses, many real and some imagined, of the Freedom of Information Act. To be sure, many of the reporters on the Hill gripe and complain to each other and to their editors about these closed-door meetings. And many of them stand keeping vigil outside the doors, waiting for Reid or Pelosi to come out and offer them a morsel of information. But that's not good enough. It's time for a sit-down protest by journalists whose first job is to uphold the public's right to know what its government is doing. Invite readers to come join them in demanding open meetings. The last thing Reid and Pelosi want is the spectacle of the Capitol Hill Police dragging protesting journalists away from the closed doors. It's time to show some cojones, people. Tags: Capitol Hill, government transparency, protests, reporter To share or post to your site, click on "Post Link". Please mention / link to the ARRA News Service. Thanks! 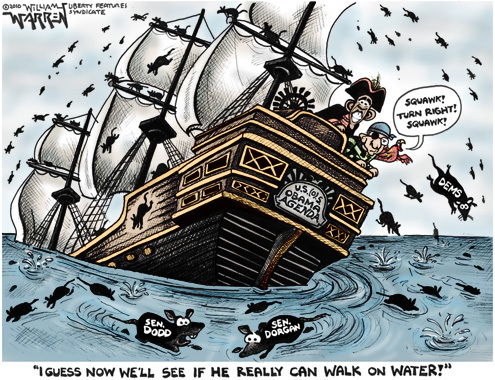 Tags: Byron Dorgan, Chris Dodd, Democrats, Obama administration, rats jumping ship, Barack Obama, walk on water, political cartoon, William Warren To share or post to your site, click on "Post Link". Please mention / link to the ARRA News Service. Thanks! Seniors’ Advocacy Organization Gives Millions to…High Schools? “Our focus is on issues….Here, policy trumps everything.” — Associated Press story quoting AARP Executive Vice President for Social Impact Nancy LeaMond,who in 2008 received $385,598 in salary and $36,081 in other compensation from the organization. • A review of its financial statements finds that in 2008, AARP received $652.7 million in direct “royalties and fees” from selling products like Medigap supplemental insurance policies. Royalty revenues now comprise more than half — 60.3% — of all AARP revenues; in 2008, fully 38% of AARP’s $1.1 billion in revenue came directly from United Healthcare. o $21,624,619 to the AARP Foundation. While grants to schools, “affordable green housing,” and public broadcasting may be worthwhile efforts, many may question their relationship to AARP’s stated mission as a seniors advocacy organization. Moreover, a Bloomberg news analysis published in December found that seniors have been charged hundreds of dollars above market rates for AARP-branded coverage—a practice which several of the organization’s own members called “unconscionable.” Given these facts, many may question: Whom does AARP serve — its members, or its executives’ political wishes? And is AARP a seniors’ advocacy group, or a billion-dollar insurance company masquerading as a “charity” organization? Tags: AARP, dirty secret, government healthcare, kickbacks, liberals, medicare, royalties, seniors To share or post to your site, click on "Post Link". Please mention / link to the ARRA News Service. Thanks! ARRA News Service - This week the Centers for Medicare and Medicaid Services announced it was investigating Humana for providing “misleading” information regarding the Administration’s proposed cuts to Medicare Advantage policies—and prohibited other Medicare Advantage plans from providing similar information on how Democrat health “reform” could take away their current coverage. • The Congressional Budget Office has previously estimated that the cuts to Medicare Advantage plans proposed in Democrats’ government takeover of health care (H.R. 3200) would cause millions of seniors to lose their current plan and enroll in government-run Medicare. • Because the government-run Medicare benefit is less generous than most private health plans, the independent Medicare Payment Advisory Commission found in June that more than nine in ten seniors not in nursing home settings utilize some form of Medicare supplemental insurance. While many of these individuals currently rely on Medicare Advantage plans for the extra benefits they provide to seniors, many would be forced to purchase supplemental Medigap policies should their existing Medicare Advantage plans be taken away from them due to Democrats’ government takeover of health care. • A review of its financial statements finds that in 2008, AARP received more than half a billion dollars in revenue from selling products like Medigap supplemental insurance policies—$652.7 million in direct “royalties and fees,” and an increase of more than 31 percent from the $497.6 million in similar revenue AARP generated in 2007. • Royalty revenues now comprise more than half — 60.3% - of all AARP revenues; a Bloomberg news analysis published in December found that in 1999, royalties comprised only 11% of the organization’s total revenues. • The Bloomberg article—which highlighted what one observer called AARP’s “dirty little secret”— profiled seniors who felt betrayed after paying hundreds of dollars above market price for AARP branded coverage. One noted that “AARP has great buying power, and people should be able to get the best deal….This is unconscionable, what AARP has allowed to happen.” Another disillusioned senior wrote to the organization’s leadership asking whether AARP had a “‘special relationship’ with [insurance carriers] by which it receives commissions, incentives, rebates, or dare I say ‘kickbacks?’”—and when he arrived at AARP headquarters for a tour, was promptly escorted out of the marble-covered atrium. • While H.R. 3200 would place strict price controls on Medicare Advantage plans—requiring them to pay out 85% of premium revenues in medical claims — Medigap policies face a far less strict 65% requirement. In other words, under the Democrat bill, seniors could pay as much as 20 cents more out of every premium dollar to fund “kickbacks” to AARP-sponsored Medigap plans than Medicare Advantage plans. • Given the myriad new layers of insurance regulation included in Democrats’ government takeover of health care, why does the legislation not include a single provision attempting to impose any new restrictions on Medigap policies? • Did Democrats “forget” to protect seniors—or were they informed that AARP could not support legislation that would limit its lucrative revenue source? • Similarly, did CMS “forget” to include AARP among the organizations whose First Amendment rights to inform seniors of harmful Medicare provisions were restricted—or did the Administration only wish to silence its critics, and not outside organizations using “kickbacks” to fund advertising in support of the Democrat agenda? These questions hint at a more fundamental query: With seniors believing that AARP is “making money on the backs of old people,” who should believe that the organization is looking out for seniors’ interests and not its own? A Government takeover of Healthcare is knocking on America's door. Unfortunately for Americans, Nancy Pelosi and her Liberals allies aren't opening up their door to let anyone in on the process. Tags: closed doors, government healthcare, government transparency, NRCC, Obama administration To share or post to your site, click on "Post Link". Please mention / link to the ARRA News Service. Thanks! Democrats Behind Closed Doors - What Are They Trying to Hide? While the Obama Administration and Congressional Democrats are planning to negotiate a government takeover of health care behind closed doors, House Republicans reissued their video to ask, "what are they trying to hide?" Tags: closed doors, Democrats, government healthcare, House Republicans To share or post to your site, click on "Post Link". Please mention / link to the ARRA News Service. Thanks! by Ken Blackwell, Contributing Author, Ken Klukowski, and Sen. Orrin Hatch: President Obama's health-care bill is now moving toward final passage. The policy issues may be coming to an end, but the legal issues are certain to continue because key provisions of this dangerous legislation are unconstitutional. Legally speaking, this legislation creates a target-rich environment. We will focus on three of its more glaring constitutional defects. First, the Constitution does not give Congress the power to require that Americans purchase health insurance. Congress must be able to point to at least one of its powers listed in the Constitution as the basis of any legislation it passes. None of those powers justifies the individual insurance mandate. Congress's powers to tax and spend do not apply because the mandate neither taxes nor spends. The only other option is Congress's power to regulate interstate commerce. Congress has many times stretched this power to the breaking point, exceeding even the expanded version of the commerce power established by the Supreme Court since the Great Depression. It is one thing, however, for Congress to regulate economic activity in which individuals choose to engage; it is another to require that individuals engage in such activity. That is not a difference in degree, but instead a difference in kind. It is a line that Congress has never crossed and the courts have never sanctioned. In fact, the Supreme Court in United States v. Lopez (1995) rejected a version of the commerce power so expansive that it would leave virtually no activities by individuals that Congress could not regulate. By requiring Americans to use their own money to purchase a particular good or service, Congress would be doing exactly what the court said it could not do. Some have argued that Congress may pass any legislation that it believes will serve the "general welfare." 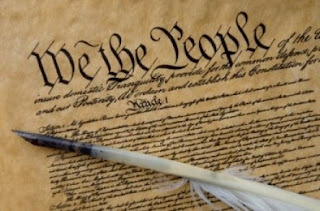 Those words appear in Article I of the Constitution, but they do not create a free-floating power for Congress simply to go forth and legislate well. Rather, the general welfare clause identifies the purpose for which Congress may spend money. The individual mandate tells Americans how they must spend the money Congress has not taken from them and has nothing to do with congressional spending. A second constitutional defect of the Reid bill passed in the Senate involves the deals he cut to secure the votes of individual senators. Some of those deals do involve spending programs because they waive certain states' obligation to contribute to the Medicaid program. This selective spending targeted at certain states runs afoul of the general welfare clause. The welfare it serves is instead very specific and has been dubbed "cash for cloture" because it secured the 60 votes the majority needed to end debate and pass this legislation. A third constitutional defect in this ObamaCare legislation is its command that states establish such things as benefit exchanges, which will require state legislation and regulations. This is not a condition for receiving federal funds, which would still leave some kind of choice to the states. No, this legislation requires states to establish these exchanges or says that the Secretary of Health and Human Services will step in and do it for them. It renders states little more than subdivisions of the federal government. This violates the letter, the spirit, and the interpretation of our federal-state form of government. Some may have come to consider federalism an archaic annoyance, perhaps an amusing topic for law-school seminars but certainly not a substantive rule for structuring government. But in New York v. United States (1992) and Printz v. United States (1997), the Supreme Court struck down two laws on the grounds that the Constitution forbids the federal government from commandeering any branch of state government to administer a federal program. That is, by drafting and by deliberate design, exactly what this legislation would do. 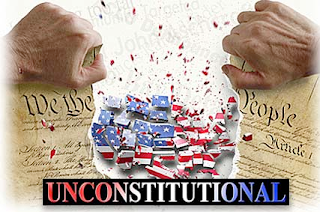 The federal government may exercise only the powers granted to it or denied to the states. The states may do everything else. This is why, for example, states may have authority to require individuals to purchase health insurance but the federal government does not. It is also the reason states may require that individuals purchase car insurance before choosing to drive a car, but the federal government may not require all individuals to purchase health insurance. This hardly exhausts the list of constitutional problems with this legislation, which would take the federal government into uncharted political and legal territory. Analysts, scholars and litigators are just beginning to examine the issues we have raised and other issues that may well lead to future litigation. America's founders intended the federal government to have limited powers and that the states have an independent sovereign place in our system of government. The Obama/Reid/Pelosi legislation to take control of the American health-care system is the most sweeping and intrusive federal program ever devised. If the federal government can do this, then it can do anything, and the limits on government power that our liberty requires will be more myth than reality. Mr. Ken Blackwell is a conservative family values advocate. He submitted this article to the ARRA News Service Editor which also appears in his Opinion Editorial, Wall Street Journal. Blackwell is a former U.S. Ambassador to the United Nations Human Rights Commission and is a senior fellow at the Family Research Council and American Civil Rights Union. Mr. Ken Klukowski is a fellow and senior legal analyst with the American Civil Rights Union. Mr. Hatch, a Republican senator from Utah, is a former chairman of the Senate Judiciary Committee. Tags: government healthcare, heath care, Ken Blackwell, Ken Klukowski, Obamacare, Orrin Hatch, unconstitutional, US Constitution To share or post to your site, click on "Post Link". Please mention / link to the ARRA News Service. Thanks! By Ernest S. Christian and Gary A Robbins, IBD Editorials: No matter who he is, the president of the United States has far too many powers over our lives and livelihoods. So do members of Congress. Even if the holders of these public offices were capable of correctly performing such a vast multiplicity of complex tasks, which they aren't, and even if their intentions were always honorable, which they often aren't, it is absurd that a handful of exceedingly ordinary, highly fallible people should be telling 300 million Americans what to do, say and think — and even more ridiculous that we let them. Are they smarter than we are? Are they morally superior? Are they better able to run our affairs than we are? Are their intentions toward us better than our own? Do they make us better or better off? Of course not. Just the opposite. Their record of failure is manifest. Why should we pay them exorbitant salaries to ruin the economy and abridge our liberties? The current incumbents should be fired. Their jobs should be downgraded in power and scope. The staff of nearly 3 million civilian bureaucrats should be redeployed. Those of us who add value to the national balance sheet should not be ruled over by those who don't. We should not have to stand in line and ask permission to enjoy the inalienable rights given us by our Creator. Civil governance in America is not supposed to be intrusive, much less oppressive. Left alone, all we really need is for government to perform a few simple jobs under our close supervision and on a strict budget. Yet we are painfully bound from head to foot in reams of expensive federal red tape that our captors in Washington pull ever tighter. With tens of millions of federal interventions occurring every minute, the machinery of government is so vast and complex that it can no longer be operated safely — especially not by politicians inured to the daily process of destroying lives, jobs and wealth. The politicians we put in charge of our lives and livelihoods are by no means the best and brightest people among us. Typically they are meddlesome by nature and given to high-risk experimentation, using us like guinea pigs. Most are inveterate spendthrifts. America's presidents and members of Congress are selected by election — but elections are not divine rites that make the unqualified qualified or convert ordinary individuals into paragons of virtue and superior intellect. Tags: elected officials, politicians, not the best, not the brightest, Ernest S. Christian, Gary A Robbins, Editorial To share or post to your site, click on "Post Link". Please mention / link to the ARRA News Service. Thanks! The Health Care "Open Process" Behind "Closed Doors"
Tags: Democrats, government healthcare, government transparency, Nancy Pelosi, US House, US Senate To share or post to your site, click on "Post Link". Please mention / link to the ARRA News Service. Thanks! 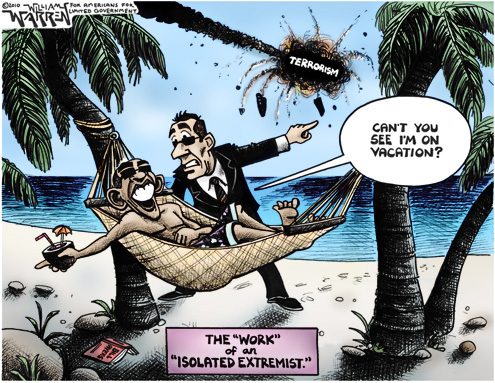 Tags: Barack Obama, on vacation, isolated extremist, Islamic terrorist, political cartoon, William Warren To share or post to your site, click on "Post Link". Please mention / link to the ARRA News Service. Thanks! Bill Smith, Editor: Having been traveling and preparing for Christmas, I delayed posting about a great American "mustang" who reported for duty with his former comrades. A "mustang" is an enlisted person who goes on to be commissioned an officer. As a staff sergeant, Robert "Bob" Howard served his country in the jungles of Vietnam, Laos and Cambodia. Howard was a Green Beret, Special Forces. His heroic efforts in three individual actions during thirteen months spanning 1967–1968 resulted in his being nominated for the Congressional Medal of Honor. However, since the government had used him and other in places and situations being kept secret from those back home, the initial two nominations were downgraded to the Distinguished Service Cross. 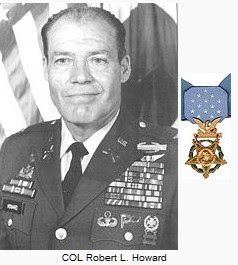 Robert Howard as a Sergeant First Class risked his life during a rescue mission in Cambodia on December 30, 1968, while second in command of a platoon-sized Hornet force that was searching for missing American soldier Robert Scherdin, and he was finally awarded the Medal of Honor. He served five tours of duty in Vietnam and was wounded 14 times during one 54-month period during the Vietnam Conflict. He received two Masters degrees during his government career which spanned almost 50 years. Howard retired as a full Colonel in 2006. According to NBC News, "Howard may be the most highly-decorated American soldier since World War II. His residence was in Texas and he spent much of his free time working with veterans at the time of his death. He also took periodic trips to Iraq to visit active duty troops." Howard died in Waco, Texas on December 23, 2009. He was survived by three children and four grandchildren. In any other time or era, Bob Howard would have been the recognized hero of the times. As potentially the most decorated hero since WWII, Bob earned his place in history through sacrifice and risking his life for others. It was the anti-war sentiment of the 60's and 70's that blamed the the military and not their government for the American involvement in Vietnam. It was a disgraceful period of time in American history when traitors like Jane Fonda, draft dodgers like Bill Clinton and self aggrandizement seekers like John Kerry would get more credit and fame than those who served their country with honor when called for by their country. Thank you Col. Bob Howard for your service. I pray you have now found a peaceful rest. Family Security Matters rightly states: "If America does not honor men like Bob Howard, then we have no heart, no soul, no brains left." Watch the following tribute by Brian Williams, a member of the Board of Directors of the Congressional Medal of Honor Foundation. by Jim Brown, OneNewsNow: A constitutional historian says American courts would have to overturn their last 80 years of jurisprudence to uphold the constitutionality of the healthcare bill in Congress. Thirteen Republican attorneys general are threatening to file a lawsuit against the Democrats' healthcare bill if Senate Majority Leader Harry Reid (D-Nevada) and House Speaker Nancy Pelosi (D-California) refuse to remove a provision being called the "Cornhusker Kickback" -- the nearly $100 million Medicaid deal Democratic Senator Ben Nelson secured for his home state of Nebraska. Ostensibly, the deal was in exchange for Nelson's vote -- the 60th of 60 needed -- favoring the legislation. As reported earlier, the senator's decision has angered many Nebraskans. In a letter sent last week, the 13 attorneys general argue the provision is "constitutionally flawed" and violates the U.S. Constitution's protection against "arbitrary" legislation. Constitutional historian David Barton, the president of WallBuilders , also believes the provision is unconstitutional. "I think there's huge constitutional problems with this thing," exclaims Barton, "and it may be that we see the power of Congress limited constitutionally through a number of different venues by these various lawsuits that are out there." Barton notes that court challenges are looming over the bill's individual mandate, as well as its anti-trust provision that forces a government monopoly. Texas Governor Rick Perry has also threatened to file a lawsuit, arguing the bill violates states' rights outlined in the Tenth Amendment. Just before Christmas, The Heritage Foundation also questioned the constitutional legality of the healthcare legislation, publishing a legal memorandum charging that the individual mandate "takes congressional power and control to a striking new level." The letter to Senator Reid and Congresswoman Pelosi was signed by top prosecutors in Alabama, Colorado, Florida, Idaho, Michigan, North Dakota, Pennsylvania, South Carolina, South Dakota, Texas, Utah, Virginia, and Washington state. Four of the Republican attorneys general are running for governor in their respective states. Tags: Attorney General, constitution, government run, health care To share or post to your site, click on "Post Link". Please mention / link to the ARRA News Service. Thanks! 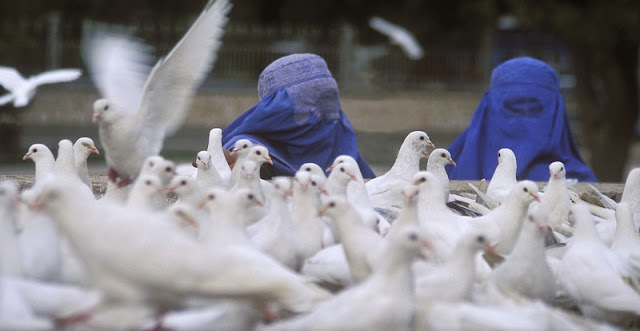 Tags: Afghanistan, Barack Obama, political satire To share or post to your site, click on "Post Link". Please mention / link to the ARRA News Service. Thanks! by Robert Romano, ALG Senior News Editor: Which is the greater likelihood? That Unidentified Flying Objects (UFO's) are visiting Earth, or that Barack Obama's proposed $2.5 trillion health bill will actually reduce the deficit as promised? Believe it or not, more Americans believe in UFO's than think legislation taking over the nation's health care system will do anything but add to the nation's insurmountable $12 trillion debt. According to Rasmussen Reports, "The survey finds that 68% believe the legislation will increase the federal budget deficit. Only 11% say the program will achieve its stated goal of deficit reduction." Astrology (29%), ghosts (34%), and witches (24%) all poll better than specious claims that providing health coverage to 30-45 million additional people will not cost anything. Which is really not that surprising. The Senate version of the bill — which allegedly removes the “public option” from the plan — will spend some $350 billion more than it takes in through revenues in its first ten years alone, as ALG News has previously reported. None of which bodes well for Congressional Democrats, especially for some 18 Blue Dogs in the House who promised in a letter not to vote for a bill that was not deficit-neutral, and then did anyway. They were: Baron Hill (IN-CD9), Gabrielle Giffords (AZ-CD8), Patrick Murphy (PA-CD8), Mike Michaud (ME-CD2), Leonard Boswell (IA-CD3), John Salazar (CO-CD3), Travis Childers (MS-CD1), Christopher Carney (PA-CD10, Jim Cooper (TN-CD5), Sanford Bishop (GA-CD2), Marion Berry (AR-CD1), David Scott (GA-CD13), Kathy Dahlkemper (PA-CD3), Michael Arcuri (NY-CD24), Jim Costa (CA-CD20), Joe Baca (CA-CD43), Dennis Moore (KS-CD3), and Zack Space (OH-CD18). They may, however, be able to boost their popularity by ordering an investigation of the Roswell “weather balloon” crash of 1947, or attending a few Star Trek conventions. Beam them up, Scotty. Tags: Blue Dog, health care, Rasmussen Poll, UFO To share or post to your site, click on "Post Link". Please mention / link to the ARRA News Service. Thanks! The U.S. Treasury said today it will inject another $3.8 billion into troubled lender GMAC, part of a deal that will boost the federal government's stake to 56% and attempt to staunch the company's losses from bad mortgages. All of the money injected by the Treasury will essentially go to shoring up GMAC's ResCap unit, the arm best known for ditech.com and other housing-boom related mortgage offers that crashed as housing prices withered over the past couple of years. GMAC said the move, along with a $3.3 billion write-down in mortgages at ResCap and Ally Bank, should allow it to explore a sale or other action for ResCap. "By protecting the financial performance and strength of our core automotive finance operations, we expect to increase the pace at which we can fully repay the U.S. taxpayer,” said GMAC Chief Executive Officer Michael A. Carpenter. The money comes on top of $12.5 billion that the U.S. Treasury had previously invested in GMAC to keep it afloat as the lender of choice for car buyers and dealers at General Motors and Chrysler. The new 'loans' make the US Government the majority share holder in this zombie company. GMAC will become the sixth company the U.S. has taken control of in the past two years. Public-private mortgage lenders Fannie Mae and Freddie Mac, auto manufacturers General Motors and Chrysler and the largest commercial insurer in the U.S., American International Group. Tags: auto bailout, federal spending, GMAC, National Debt, US Treasury To share or post to your site, click on "Post Link". Please mention / link to the ARRA News Service. Thanks! 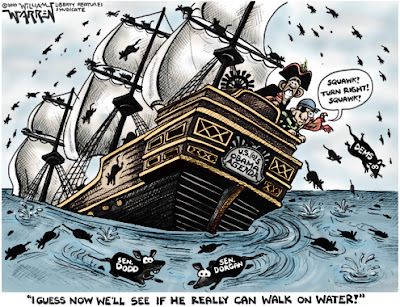 Tags: 2009, Political Cartoons, William Warren To share or post to your site, click on "Post Link". Please mention / link to the ARRA News Service. Thanks!